As discussed in last year’s article(1) the “31 Tannery Project” is the first commercial building in the US to produce all of its own electricity through a renewable power source. The nationally recognized, award winning project has actually produced in excess of a month’s surplus of green energy for others to use. The surplus power is now being used to charge plug in hybrid electric vehicles (PHEV) in Ferreira’s fleet. The 31 Tannery Project also served as an incubator for Noveda Technologies™, a real-time energy monitoring product that provides end users with a clear concise snapshot of their facility’s energy usage and avoided cost and consumption. Since we moved in to 31 Tannery in May 2006, more than two and a half years has passed. The building, which serves as the corporate headquarters for the Ferreira Companies and Noveda Technologies™, located in Branchburg, NJ continues to evolve and serve as a “living lab” and a “hands on” showcase of energy efficiency (EE), renewable energy (RE), and monitoring and visualization systems (MV). The building performance continues to exceed expectations. The ability to maintain long term and sustainable operations requires feedback to the building designers, operators and occupants. This is the power of monitoring and visualization systems running in parallel with energy metering and direct digital control (DDC) systems. These systems can take the form of handheld, laptop or desktop web-based displays or wall or free standing kiosks. In any and all of these display devices the key is simplicity; providing detailed and complex data presented in an easy to understand graphic in real time so the user may confidently take action. 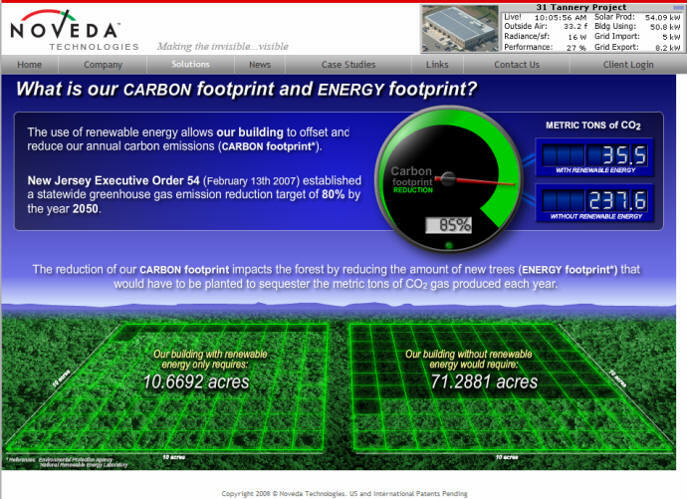 On July 12, 2008 another important milestone was met with the second year of net zero electric operation. 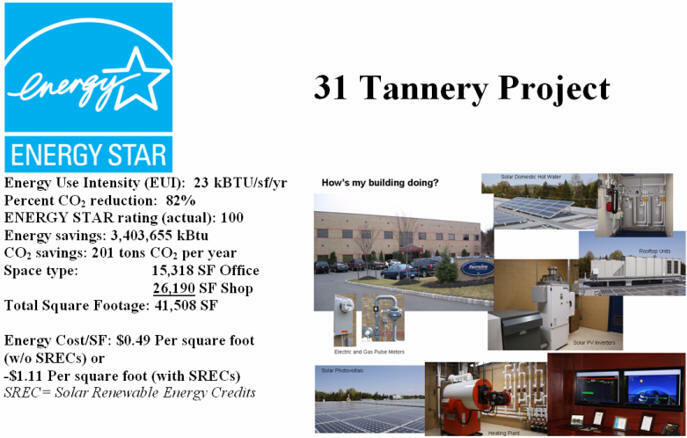 For the second year in a row, the 31 Tannery Road building produced more electricity than was consumed on an annual basis and maintained an Energy Star Buildings rating score of 100.According to the Energy Star Statement of Energy Performance, our facility’s site energy intensity was 23 kBtu/ft2/year versus an industry average of 141 kBtu/ft2/year and an Energy Star 75 building of 107 kBtu/ft2/year. From this analysis the 31 Tannery Road building is 84% below average in site energy and 79% below an EPA Energy Star 75 comparable building. We were able to achieve such comparatively low energy intensity ratings and CO2 emissions because our facility implemented high efficiency HVAC equipment and real-time continuous energy monitoring. 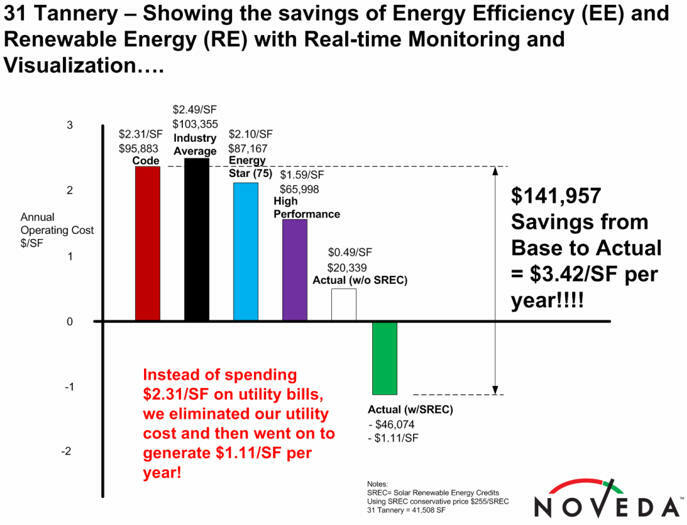 Any abnormalities in equipment operation were instantly seen from Noveda Technologies™ real-time monitoring software, allowing us to react quickly and remedy irregularities before they could detrimentally affect our overall energy consumption profile. We would not have been able to score another 100 energy performance rating if we waited for the monthly utility bill to arrive. The success of the energy efficiency, renewable energy and monitoring & visualization systems can be seen in the graph below which compares how the building performs in accordance with various baseline metrics. The most dramatic point is the actual cost to operate the building after covering the monthly electric and gas utility bills and accounting for the solar renewable energy credits (SRECs). 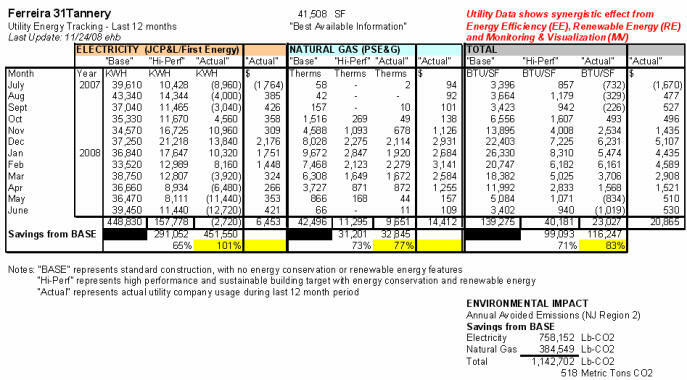 This shows that the 31 Tannery Road building actually nets a very conservative $1.11 per square foot per year after covering all electric and natural gas utility costs. On February 13, 2007 Governor Jon Corzine of New Jersey signed Executive Order 54 that calls for an aggressive reduction in Greenhouse Gas Emissions. The goal is a stabilization of greenhouse gas emissions at 1990 levels by 2020 and a further reduction of 80% below 2006 levels by 2050. The 31 Tannery Project met and exceeded the 2050 level in 2007, and continues to maintain this reduction. The monitoring and visualization system is salient to assisting us in continuing to meet our goal of reducing our carbon footprint. This requires that we constantly track and display how we are doing. The real-time screen snapshot below was taken Monday, November 24, 2008 at 10:05AM. This screen shows how we are doing on reducing our carbon and energy footprint for 31 Tannery for electricity and natural gas for the last 365 days. We have a fleet of hybrid vehicles here at 31 Tannery from various manufacturers. A 2008 Toyota Prius was recently converted to allow for solar powered plug-in hybrid vehicle (SPHEV) operation. We are starting to tabulate our preliminary results from this conversion and using our NovedaTM mobile energy lab unit to monitor the electrical energy from the building to the modified Toyota Prius. 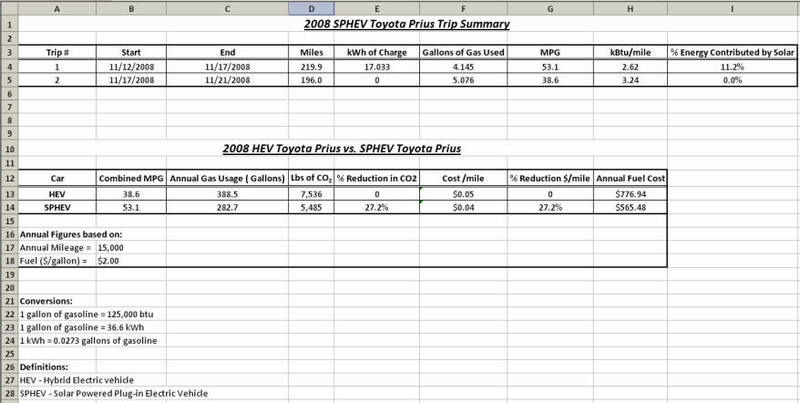 Here’s a snapshot of a plug in hybrid electric vehicle recharge cycle using 5.4 KWh of solar energy. First Net Zero Electric commercial building in the U.S.